Army Cadets from 92 Catford Detachment, Greater London South East Sector ACF, played host to the 2012 Olympic Torch Relay Team as they passed through the streets of Catford on Monday morning, 23 July. On the flame’s epic journey through South London, the changeover between Torchbearers Christopher Dollellan and Mark Healey took place at 8.30am outside the cadets' hut at the TA Centre in Bromley Road. 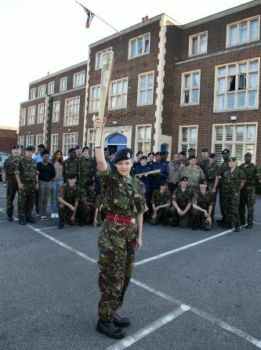 Hundreds of local residents were lining the streets to watch the flame go past and the Reservists and Cadets were on hand to offer refreshments and comfort facilities to the Torchbearers and their families as the Olympic flame travelled on its way to Bromley. Captain Tom Roach, who co-ordinated the reservists’ support said: "It’s been wonderful for our local reservists and cadets to have played a small part in today’s event and to watch the Olympic flame travel right past our front gates. To engage with the local community on this momentous occasion was truly inspiring; it was a day the Squadron will always remember fondly". The photo shows Jodie Young from Crayford detachment holding the Olympic Torch.